Low [oil prices] prices are increasing demand and will also dramatically reduce supply. 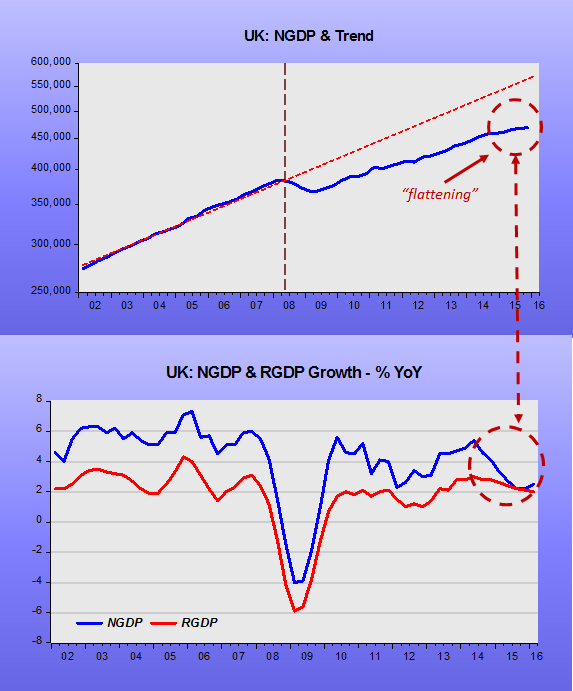 UK NGDP growth was released today together with the second estimate of RGDP figures. NGDP picked up slightly to 2.5% YoY. 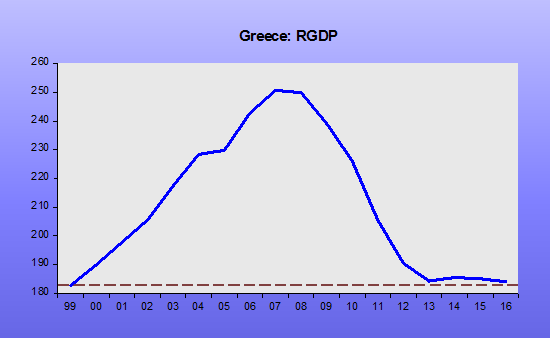 We had earlier shown a similar trend using Nominal GVA data. The very messy and subsequently revised figures from 3Q and 4Q last year now show two quarters of a very low 2.2% YoY growth. NGDP growth was very poor before Brexit concerns and has, if anything, now picked up slightly as those concerns have increased. Rather ironic given all the scaremongering – perhaps the GBP weakness helped ease the concerns. Carney solemnly swore that there had been no government interference forcing the Bank of England to take its strong anti-Brexit stance. We believe him. All the ruling elites of both the UK and the Rest of the World are taking the same view. They are not at the sharp end of the woeful nominal growth that constantly drags down real growth. Above everything they prefer governments to be remote from the public and in the hands of self-selected technocrats who should be trusted to do the right thing. The evidence from the UK is that Carney is failing badly. “Remain” economists remain surprised by the strength of the Brexit support despite all their best efforts. Well, they should look at nominal growth and not be so surprised. 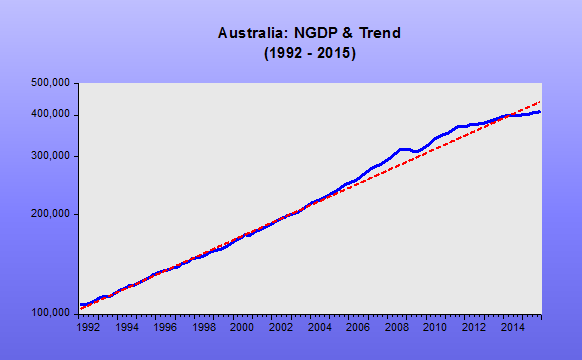 Mainstream macro-economists fail in so many ways, but none more so in their relaxed attitude to low Aggregate Demand (aka NGDP) growth. The Brexit debate is a sideshow compared to this abdication of responsibility. Carney and his political master George Osborne should have been alarmed at the trend of nominal growth in the UK. Even if Brexit concerns are not preventing a small rise in nominal growth the rate is still far too low. Carney still believes that the next move is up in interest rates, so cementing a policy of passive monetary tightening. When he strongly repeated his view this week, Sterling rose strongly. Just great. It’s not clear if all his Monetary Policy Committee agree with him but they don’t seem brave enough to speak out much. In recent exchanges over Brexit Carney looks like a very hard man to cross. His responses to Jacob Rees Mogg in Parliamentary questions over the BoE’s anti-Brexit stance were a cross between Tony Blair and Bill Clinton. About right as he has passed from wannabe Canadian politician to global stage-trotter. He has become the model of a very modern hawkish central banker more concerned about fighting non-existent inflation threats than doing his upmost to help create prosperity. This is a shame. We had high hopes back in the day he openly talked about NGDP Targeting. If he had to face an electorate worried about prosperity perhaps he would change his tune. It probably wouldn’t have much effect given the little impact it seems to have on his boss, Osborne. Where do “beliefs” come from? Mr Blanchard thinks the biggest risk for the US economy may be that markets are misreading the data and being too gloomy instead of recognising that the recovery is “one of the most balanced … we have had in a long time”. They should have a better reading of history. 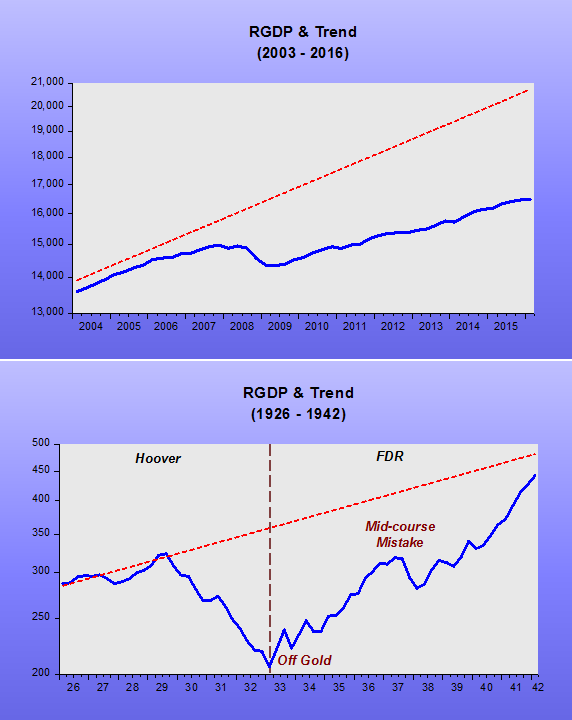 The world even managed to recover from the Great Depression (for the US it happened before it got into WWII). Why not from a much “milder” one? And calling this “recovery” as “one of the most balanced” borders on criminal! In the US, many, like Blanchard and Krugman, have for long advocated a higher inflation target as a means of getting the economy ‘moving’. However, if the Fed, just as the ECB, BoE or BoJ are having a hard time pushing inflation up to the 2% target, why should a higher target “solve” the problem? The RBA is likely to indicate that it remains wedded to the target, stressing that there is a high degree of flexibility for policy that goes with it. But the target doubters argue that if low inflation is entrenched, there seems little sense in promoting a target that won’t be achieved without driving interest rates still lower and inviting financial sector stresses in the process. In other words, why risk the fallout from a domestic housing bubble by obsessing over a price target that global forces are keeping out of your reach? Funny how central banks all over are quick to say they´re “powerless”. That´s just like a “forger” saying that he has no money to buy a new car! What central banks miss is that inflation is low, not because of “structural” (or entrenched) reasons, but because they are conducting monetary policy to make it so! 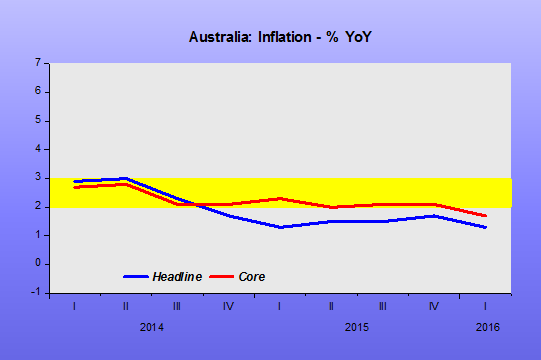 Australia provides a good example of good monetary policy that has more recently turned bad. The chart shows that since the IT regime was adopted, inflation has clocked 2.5% on average, for either the headline or core measures. That´s exactly the center of the 2% to 3% target band. 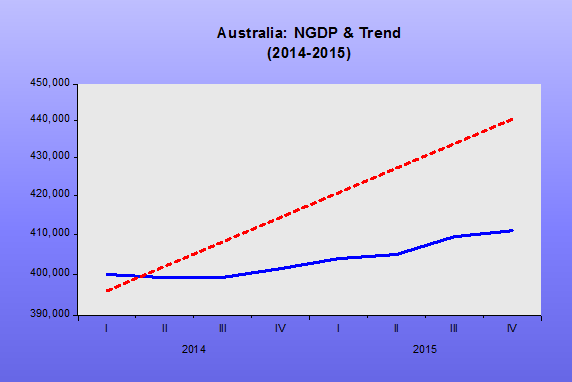 Meanwhile, monetary policy was mostly good, keeping NGDP evolving close to a level target path. 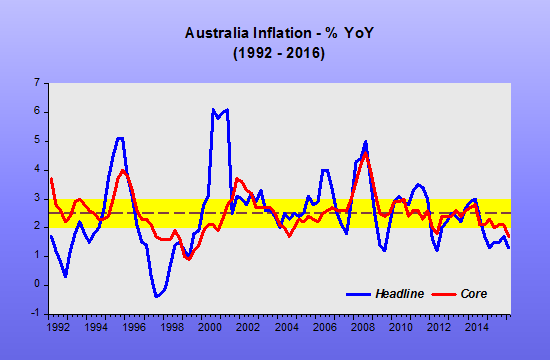 For the past two years, however, the RBA has been “sleeping at the helm”. NGDP has deviated systematically from the “target level”. 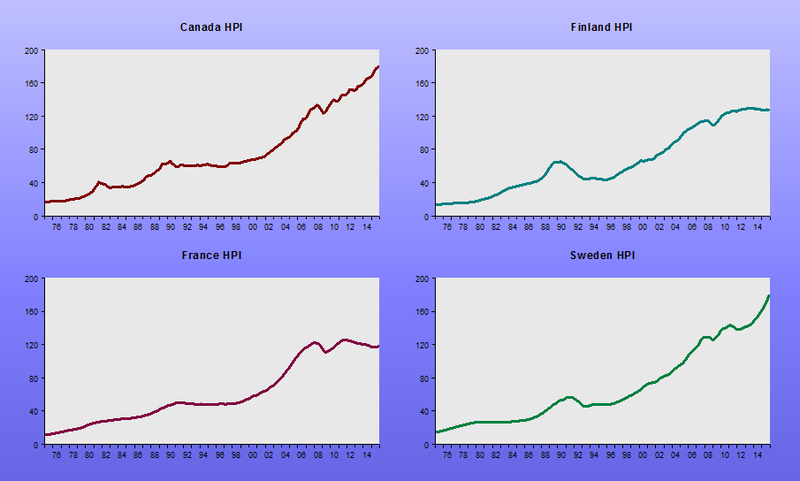 So, it´s not at all surprising that inflation, in either guise, is also trending below the target band! The “solution” is not to have a higher or lower inflation target, but to “get a grip” on nominal spending (NGDP). If the RBA says it´s “powerless” to do so, bring in a “master forger” like Gideon Gono, the former head of Zimbabwe´s central bank. To judge from last week’s surprisingly hawkish FOMC minutes, which I had not expected, the Fed seems to be reverting to type (see Tim Duy). Many committee members have downplayed foreign risks and have returned to their earlier focus on the strength of the domestic US labour market, which in their view is already at full employment. This kind of uncertainty — about which goals will define the Fed’s policies — is not healthy. Consumers and businesses can’t make good decisions if they don’t have a strong enough sense of how the central bank will act in any situation. Fed officials must have — or be given — a much clearer set of shared objectives for managing the economy. People are typically overly optimistic when evaluating the quality of their performance on social and intellectual tasks. In particular, poor performers grossly overestimate their performances because their incompetence deprives them of the skills needed to recognize their deficits. Five studies demonstrated that poor performers lack insight into their shortcomings even in real world settings and when given incentives to be accurate. An additional meta-analysis showed that it was lack of insight into their own errors (and not mistaken assessments of their peers) that led to overly optimistic estimates among poor performers. Along the way, these studies ruled out recent alternative accounts that have been proposed to explain why poor performers hold such positive impressions of their performance. I just became more pessimistic! In Kansas City serial dissenter Hoenig was followed by frequent dissenter (mind you, all in the upward direction) George. Although I cannot give you a definitive path for how policy will evolve, I can easily see the possibility of two or three rate hikes over the remainder of the year. That said, all forecasts are subject to fairly wide confidence bands, and mine is no exception. So, even though I am aware that many of you are growing tired of the phrase “data dependent,” that is exactly what I will be. In the end, it is the tried-and-true way for conducting monetary policy. The Federal Reserve wants you to believe that the June policy meeting could result in the bank raising interest rates. Really. It could happen. They want to do it. No kidding. There’s been a virtual Greek chorus outside the Eccles Building proclaiming this the past week or so. John Williams, from the San Francisco Fed, was at it again this morning, insisting that nothing will keep the Fed from raising rates (except the data, of course) if it deems doing so appropriate. The market is listening, but not exactly buying it. In fact, the Fed seems to be “looping”! Posted on May 23, 2016 by Marcus Nunes under "Bubble"
Earlier this year, Sydney-based asset manager John Hempton teamed up with Jonathan Tepper, who runs U.S.-based hedge-fund consultancy firm Variant Perception, for an undercover investigation of Australia’s property market. Posing as a gay couple, they drove around Sydney, from glitzy beachside suburbs to the shabby city fringes, to probe potentially risky lending practices. What they found was considerably worse than what they had expected. Maybe gays pay a premium! 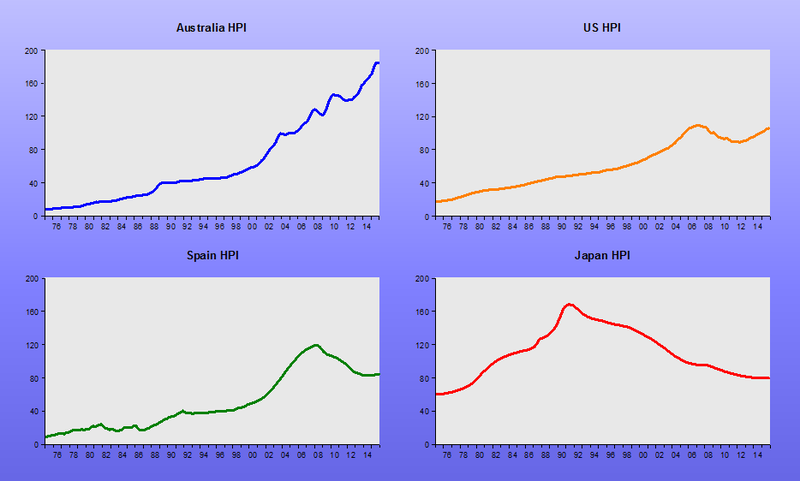 The charts show a handful of property markets. In some the “bubble” “burst”, in others the “bubble” didn´t “burst” and in others, the “bubble” is still “ongoing”!